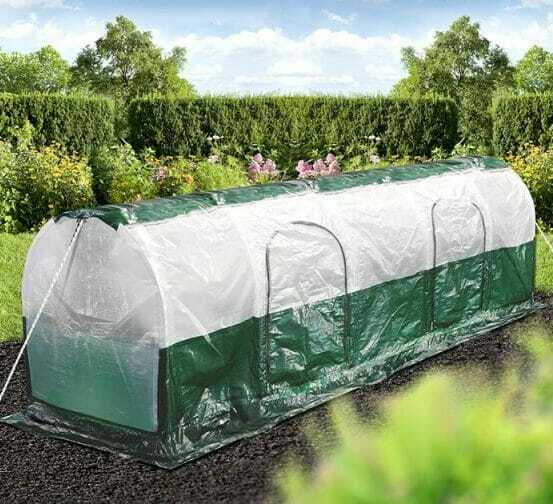 The Super Dome Polytunnel from Bio Green will extend the average growing season by as much as two months as it offers protection against frost and strong sun as well as garden pests. The German designed Super Polytunnel is made with a heavy duty transparent 90g/m2 polythene ensuring frost protection early in the season. In the summer tender plants are protected from strong sun by shading material sown in to the fabric. It has two large side openings to allow watering, weeding and ample ventilation. It is 3m (9’ 8”) long by 0.7m (27”) wide and 0.8m (31”) high. This height allows plants to develop without restriction. The surrounding frame is made from heavy duty, stainless steel and it is secured in place with two end guy-lines. The laterals on the frame can also be further secured with up to ten ground pegs that are also supplied. The Bio Green Super Dome Polytunnel offers all the benefits of a cold frame and can be moved around the garden to maximise efficiency and sunlight. For more information please visit https://biogreen.world/en/ on all products.